For the last post of the year, I'm excited to share an exclusive tour of a private residence that uses Cuban Heritage cement tiles in a custom, muted color palette. You'll find the design is peaceful and calming. The redux also shows how cement tiles are not just for flooring anymore. The tropical setting of this private home on the island of Hispaniola is the perfect locale for Cuban tiles. The home's design takes full advantage of the balmy, tropical weather and uses an open air design. You are greeted by a small sitting area that opens to a large covered, open-air patio that joins the dining room, powder room, pool, and living spaces. Our Cuban Heritage cement tiles have been popular since we introduced them over ten years ago. Because of their ubiquitous use in residential and commercial applications on the island of Cuba, cement tiles became known as Cuban tiles in some parts of the world. When Cuba was a tropical playground for jetsetters between 1920 - 1950 and for homes built in the Spanish Mediterranean Revival period, Cuban tiles were de rigueur flooring for businesses, hotels, and private estates. This pattern, Cuban Heritage Design 150, does not utilize a border that was common in traditional Cuban designs. However, the rug's colors standout from the surrounding coral stone pavers and a more contemporary feel is maintained without the use of a border. While I love the eye-catching, open-air patio with the large cement tile rug, the powder room and dining room are some of the best examples of how a traditional, handmade product can adapt to provide design consistency and durability. You'll notice that cement tile is used both on the floor and as wainscot in this small; but, rich powder room. Avente's Traditional Salcedo border cement tile is used to frame the top wainscot row. Also, notice the border pattern orientation does not change by the door as is it would in a traditional installation. All, unique details, executed flawlessly that really work. The large, formal dining room sparingly uses the same Cuban Heritage pattern and colorway as wainscot between the tall, windows and French doors that run from floor to ceiling. 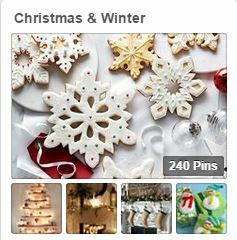 This is a nice way to maintain the color and pattern without getting "pattern overload." Leaving the dining room from the same door that I entered, I once again strolled across the large open patio that connects all the living spaces. This time, I headed away from the entrance to get a glimpse of the pool and golf course. Before, I reached my destination, I spotted a reflecting pool that provides privacy. The pool is very Romanesque; but, rather than being lined with mosaic tile they used cement tile. The same Traditional Salcedo border pattern that you see in the bathroom wainscot is used for the reflecting pool sideboard. Here the effect is even more subtle; but, the geometric design works well and helps keep the design motif consistent. I finally made it past all the stunning tile details to get a glimpse of the ocean. Wow, what a verdant and peaceful ocean view! I hope you enjoyed the exclusive tour of this private residence on the island of Hispaniola. While this classic Cuban tile pattern has been brought back to use, I think you'll agree that the redux is both unique in design and creative in application. I love how a simple, muted color palette, and repeated pattern work to create a a peaceful and harmonious theme throughout. Want to see more photos of this installation? View the slideshow below, or click to see Cuban Cement Tile with Custom Color for Residence. Cement tiles provide design flexibility because they can be customized with your choice of colors. As this project illustrates, cement tile adapt to any setting and work well in contemporary or traditional installations. Finally, you can't forget that cement tile are durable and will withstand decades of wear with little care. Finally, they can be used on floors, walls or even ceilings. They are a great way to carry a design motif, pattern or color throughout a home to achieve a cohesive and harmonious design. Visit our website to see all of the Cuban Heritage encaustic cement tile patterns and colorways we offer. Or, like this customer, you can customize the colors on any pattern to suite your distinct sense of style. Take 10% off any online order placed through January 2015. Use coupon code CHEERS. Maybe your bathroom is stuck in the 60s or maybe you just need to freshen things up a bit. The vanity backsplash serves both a functional and aesthetic purpose, adding decorative features to your bathroom while simultaneously protecting your walls from moisture. A backsplash allows you to personalize your bathroom with a style that mirrors your own taste, character, and lifestyle. So how can we choose a backsplash for a modern vanity? By nature, modern design is chic, trendy, fashionable, and in vogue. Your options for backsplashes are wide-ranging, not only based on the materials available, but the orientation of the tiles, techniques used, and molding features. You can visit Trade Winds Imports to find unique, designer quality modern bathroom vanities. There are many different types of backsplash ideas you can use in the bathroom. For vanities with travertine tops, you can match your counter with a travertine backsplash. Other materials, such as natural stone and synthetic stones like Phoenix stone, can also be complemented with a nice stone tile that matches the hues and patterns of your countertop. Dark Emperador, quartz, and marble are all ideal candidates for a gorgeous stone backsplash. 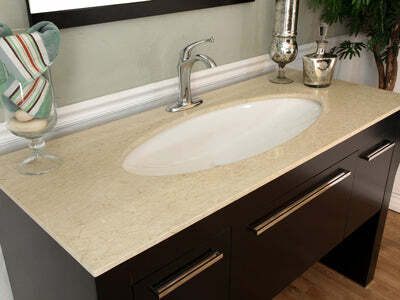 The Corinth Vanity comes with an elegant cream marble counter top. Beautifully hand-crafted cement tile always creates a stunning effect. 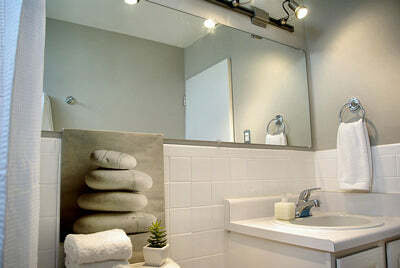 You can make your bathroom stand out by pulling together elements that mirror your personal preference. As an extra tip, tile to the ceiling to make your bathroom look bigger. This will accentuate the verticality of the room. 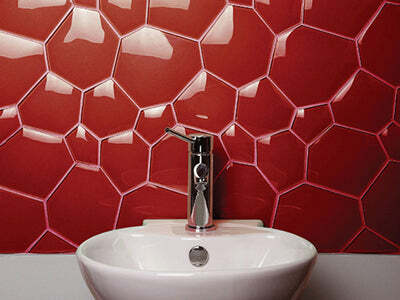 Modern and contemporary vanities have an especially enticing visual appeal when paired with a glass backsplash. You can even have the back of the glass hand-painted to create a silky smooth finish that flickers with vibrant spectrums of light. Similarly, metallic tiles can bring in the same "flash" and eye-grabbing qualities. As for shape and tile patterns, staying in line with modern design patterns will create a well-organized and uniform design. For modern applications, large tile typically creates the best effect. Less business and more simplistic and streamlined designs. Although you can experiment with laying tile diagonally in the shape of a diamond, a square tile pattern maintains the sharp edges that are characteristic of modern vanities. There are also a variety of techniques you can use including bullnose, cap, and cove. Finding the right backsplash for a modern vanity adds the icing on the cake and can really help pull together the entire design. Remember to try these tips to keep tile costs down. Cheryl Khan is a Design Consultant at TradeWindsImports.com, a fellow community member of KBTribeChat. Cheryl is knowledgeable about all phases of home remodeling, including complete kitchen and bath renovations. "Tiles tell tales!" is the way Sheila A. Menzies, Executive Director of the Tile Heritage Foundation, explained it to me many years ago. As the year draws to a close and you consider year-end donations, don't forget about this amazing organization. They need your support and engagement! The Tile Heritage Foundation (THF) is a well-run, non-profit organization that is benevolent and generous. The THF works tirelessly to validate both the art and craft of tile as a cultural treasure. As a national non-profit, THF is focused on keeping tile history, both past and present, publicly accessible in the THF Archives and with an online index. Since it was founded in 1987 by Sheila A. Menzies and Joe Taylor, this California-based non-profit has been supporting the preservation, history and appreciation of tile. This organization gives back to the tile community and works to preserve our tile heritage. Avente continues to proudly support their efforts and thanks the directors, staff and volunteers. I admit, I love tile and it's one of the reasons I started Avente Tile. Tile can take you places and the story behind each tile is an important part of our culture. Shortly after I started Avente Tile, I remember Jorge Aguayo, of Aguayo Tile explaining that he had discovered many floors in disrepair while visiting Cuba. His goal was to preserve these amazing tile tapestries. 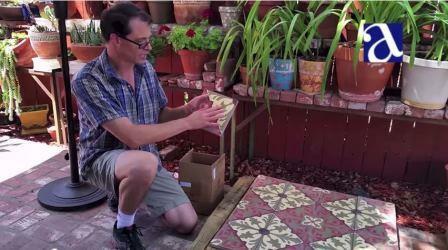 He archived the Cuban tile patterns and colors found in homes and estates on the island. We are able to share that with you today with our Cuban Heritage line. If we don’t strive to preserve and record these amazing works of art, we lose so much in the collective history of who we are. 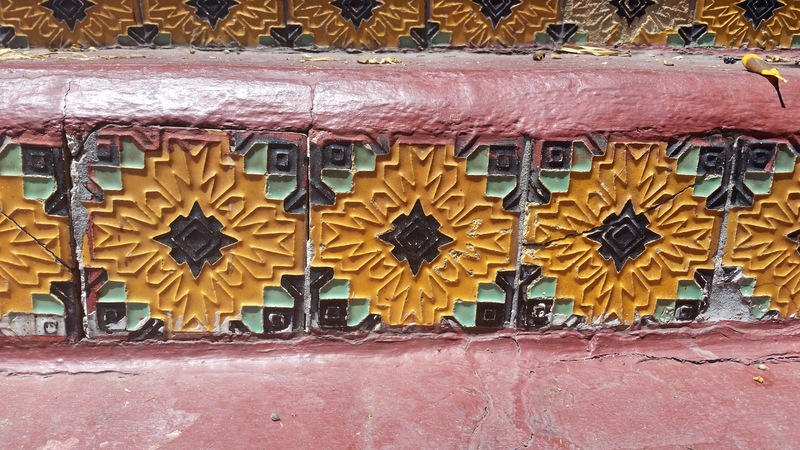 Cuban tiles found in Old Havana and Camaguey were in disrepair and nearly lost. The Tile Heritage Foundation promotes an awareness and appreciation of tiles in the United States. It provides consultation and research services, leads preservation efforts, and shares information about tile. Its library and research facility also offer a wealth of knowledge, including books and slides about ceramic tile surfaces, by providing historical perspective and depth on all ceramic surfacing materials. Because of these efforts, the organization now plays a major role in the preservation of rare existing ceramic installations. They promote contemporary tile work as well. Detail of sunflower tiles on stair risers in Beverly Hills circa 1925. 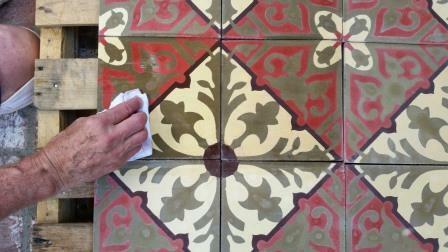 THF works to preserve significant historical tile installations. As a member of Tile Heritage, you become an advocate for the preservation of significant tile installations throughout the United States. You become a part of an international network of tile enthusiasts from around the globe! I can tell you this, it's a great group of people that really support each other. THF's archive, which is publicly accessible, offers information and examples about U.S. tile makers, business records of dealers and installers, historic catalogs, periodicals, and photography from the last 150 years. You support the continued development of a unique library of information and archival materials that are available to the public for purposes of research, restoration and preservation. You protect the Tile Heritage archives. This rich archive of tiles and related materials represent one of the largest public collections in the country! The tiles are available to galleries and museums for display and exhibitions as well as to members for personal examination. You receive a free listing in the THF Resource Directory, which is revised annually and distributed nationally. You receive Member discounts on selected merchandise, services and events. Tile Heritage keeps you connected with impartial tile news, multiple tile resources nationwide, information about new and old tile discoveries, as well as special tile-related events. I could go on about the great folks at the THF and the membership benefit; but, just visit www.tileheritage.org and discover what a great resource they are. You can also follow them on Twitter and Facebook for the latest information. Most importantly, I encourage you to join Avente Tile in supporting this great organization with a donation. Classic Serengeti; Traditional Gran Cordoba; and Geometric 02 Cement Tile. Handmade cement tiles are a great choice for commercial, hospitality, and retail spaces. Not only do these tiles deliver an unforgettable decorative impact, but because they are handmade, they can be customized to fit the client's needs, thanks to an extensive palette of colors. If it's inspiration you're craving for your next commercial design project, then make sure to view the dozens of images we've assembled within our Cement Tile Design Ideas section. Whether a bold Cuban tile pattern in contrasting colors is specified, or a classic cement pattern in harmonizing colors is chosen, you and your client can be assured of a lifetime of usage and viewing enjoyment. A cement tile mold acts as a blank canvas for applying your creativity with customization. Remember, our handmade cement tiles, which are also called encaustic cement tiles, are made one tile at a time using a method that has been in use for more than a century. It's because of this handmade process that varying amounts of customization is even possible. Of course, whether used as floor tile or wall tile, the long-lasting benefits of cement tile will positively impact and transform any space. 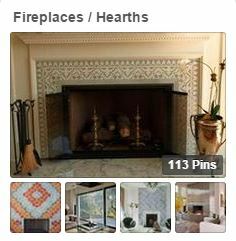 Cement tiles work well for a fireplace or hearth. The warmth they exude is further enhanced by their ability to be customized to fit any décor, or to complement surrounding materials (such as wood, carpet, concrete, etc.). Our fireplace tile design ideas include both cement and ceramic tile installations using Avente's hand-crafted tiles. There is no better choice than tile when creating a decorative and visually appealing fireplace design. Further enhancing their allure is the fact that cement tiles can be customized with any color from our Heritage Color Palette. After choosing colors, we recommend a "strike-off" or sample be made to verify the design on the tile before final production. Strike-offs can be shipped directly to you from the factory. Remember, installing cement tile is a fairly simple process, but it must be done with care in order to achieve the best results. To fully enjoy the versatility of handmade cement tile, we recommend reading our Cement Tile Installation Guide. We are also proud to offer a complete line of Cement Tile Customization Services that will help you meet or exceed your design expectations. 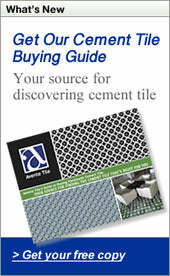 Our newly published Guide to Buying Handmade Cement Tile is an especially valuable resource to keep handy. Download a free copy here, and let the inspiration begin! Let us know how we can assist you with your next project. Please feel free to call our offices at 888.739.4972 or email us at: info@AventeTile.com. Cement tiles have the ability to create luxurious, rich designs in any environment; but, the effect is breathtaking and awesome when applied to commercial applications for restaurants and hotels because of their grand scale. The lobby of this upscale ocean-front Caribbean resort opens up to a beach via this lido that welcomes guests and invites them to relax, linger and enjoy the view. Cement tiles create a luxurious lido for this hotel property. Cement tile works well with the grand scale of commercial design. While it's hard to improve upon the beauty of cement tile, the use of a large sweeping arch in this installation provides a soft, organic curve that plays with the stylized floral pattern. The effect is breathtaking and apropos for the beach setting and view. Non-rectilinear cement tile installations amplify the tile's eye-catching effect. DESIGN TIP - For a dramatic effect, create a circular rug or large arch with patterned cement tile. This type of layout requires expert installation skills and planning. Because each tile has to be cut, both material and installation costs will be more. However, the effect is nothing short of stunning. Attention to detail and good planning are key to more complicated tile layouts. If you want to create a luxurious design or make a statement that will be remembered, consider using cement tiles in your design. The rich colors and detailing in the patterns can't be missed! Cement tiles in rich colors and detailed patterns make a luxurious statement for this hotel. If you'd like to see more photos from this commercial installation, then please view the slideshow below, or click to view Sosua Cement Tile Creates Luxury Lounge for Hotel Property. Cement tiles are a great choice for luxury commercial design. If you are a design pro in the hotel, hospitality, or restaurant design industry, use cement tile to create a custom look that stands out. Need some design inspiration for your next commercial design project? Take a look at these commercial cement tile installations.